Brewers cranked down the fermentation temperatures on Crank Tank to a chilly 11-degrees Celsius and lingered in the lagering process for an extra crisp and refreshing finish. Cyclists and beer enthusiasts alike will unite with Team SweetWater for its eighth annual Spin for Kids bike ride and fundraiser benefiting Camp Twin Lakes (CTL) this Oct. 19-20, but the buck doesn’t stop there though. SweetWater Brewing Co. is kicking it into high gear, releasing a fresh brew dedicated to the cause – a new and improved Crank Tank Helles lager peddling out the week of Sept. 16. Yep, that’s today. Crank Tank returns for its annual limited-time run after a small hiatus in 2012 due to prior brewery production constraints during its now-completed expansion. The team took a new direction in 2013 with its first attempt at a Helles style lager. Crank Tank combines Pilsner, Carapils and Munich malts, Mt. Hood and Zaaz hops and a German Helles yeast for a brew that’ll keep your chain running smooth at 5.8 percent ABV. Brewers cranked down the fermentation temperatures to a chilly 11-degrees Celsius and lingered in the lagering process on this sucker for an extra crisp and refreshing finish. Typical of traditional Munich style lagers, Crank Tank is bright and balanced, quaffable after any long ride. Fans can celebrate the cause on draft at participating restaurants and bars or pick it up in six-packs at select retail accounts throughout the state of Georgia now through the end of October. 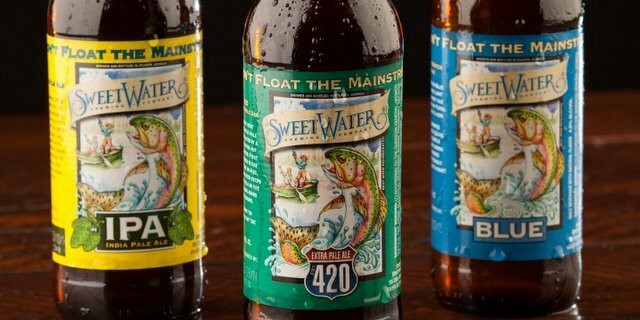 Since its inception, SweetWater Brewery has been committed to creating more than just great beer for the community. After a visit to the CTL facility, SweetWater founder and big kahuna Freddy Bensch felt a strong responsibility to spread the word about the amazing work being done at the camp for children facing serious illnesses, disabilities and other life challenges. Each year the brewery pulls together Team SweetWater, inviting friends and fans to join their ride for the cause, and donates all proceeds from their Crank Tank brew straight back to CTL. Crank It Up Kick Off Party Feat. Yacht Rock Revue: This year, SweetWater is teaming up with the superbly-smooth Yacht Rock Revue and Piedmont Park Conservancy to throw an epic kickoff shindig to help raise awareness and funds for this year’s Spin For Kids ride. The Crank It Up party will be held on Friday, Oct. 4 from 7:30-11 p.m. at the Greystone at Piedmont Park. Tickets are $35 presale/$45 at the door and include show admission plus unlimited wine and SweetWater beer (including Crank Tank), along with raffle prizes and food trucks for an additional charge. To purchase tickets visit: http://ctl.xorbia.com/crankitup.